With the evenings drawing in and Christmas suddenly seeming not that far off, we have introduced four new designs to our selection of season’s greetings cards. The third new design is Tiger in the Ark by Nicola Bayley. Nicola has been illustrating animals and their bond with humans for more than 25 years. Her attention to detail and her choice of colours earned her a nomination for the Kate Greenaway Medal for Katjie, the Windmill Cat and she also won awards for The Mousehole Cat (British Book Award for Illustrated Book of the Year and British Design Production Award). The Tiger in the Ark card is particularly relevant at a time when we are urgently raising funds to assist Wildlife Trust of India to secure safe corridors of land for tigers, and to avoid human-wildlife conflict. The fourth new design, King Penguins coming ashore, South Georgia, is by Bruce Pearson. Bruce is a WLT Trustee and a former president of the Society of Wildlife Artists. The original King Penguins watercolour was recently featured in an exhibition of Bruce’s work, An Artist in the Natural World, in WLT gallery. Cards from 2012 still available are Steve Cale’s Mistle Thrush and two by Andrew Haslen – Fox in the Snow and Winter Hare. We are particularly grateful to all four artists who have made their artwork available to WLT free of charge. 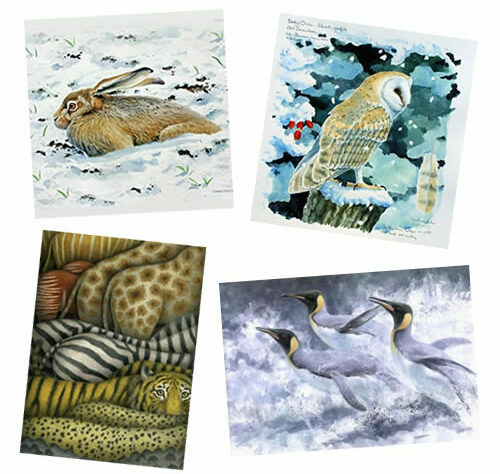 WLT’s wildlife cards come with the option of a Season’s Greetings message, or blank for your own message. Orders of at least 150 cards can be overprinted with a special message at no extra cost: orders for overprinting must reach us by 1 December.